There is a Simon Says Stamp and Lawn Fawn Co-Challenge going on on Flickr. For the challenge, I used the sentiment ‘I only have eyes for you’ from a SSS stamp set (Only Have Eyes for You) and a couple eyeglass images from a Lawn Fawn stamp set (Clear to See). A requirement of the challenge is to incorporate a kraft product such as cardstock, or kraft-colored inks, embellishments into your project. I used Neenah Environment 80 lb. Desert Storm cardstock on the card front. To add additional interest and carry the theme of Kraft further, I embellished the card with small wood veneer hearts. I added a bit of glimmer to the eyeglasses and the wood veneer hearts with my Wink of Stella pen in clear. I can’t live without this glimmer pen. 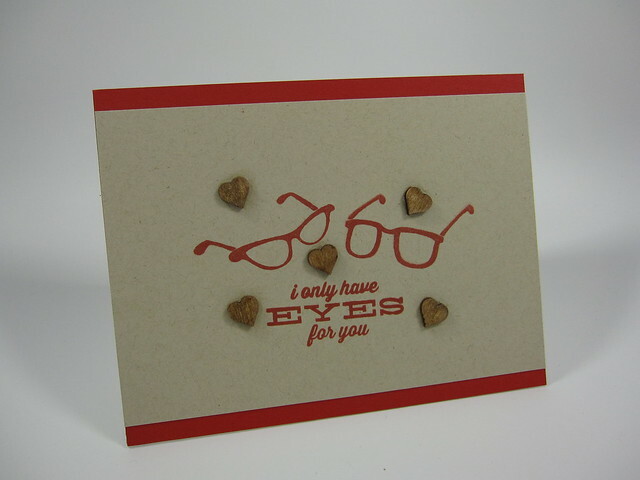 Stamps: Simon Says Stamp: Only Have Eyes for You (sentiment); Lawn Fawn: Clear to See (eyeglasses). Inks: Simon Says Stamp: Lipstick Red. I really wanted to post a few cards I made for Valentine’s Day. However, I couldn’t really post them until after V-Day because I had made these cards for various family members and close friends and was afraid that they might see them online before they received them. Since V-day has passed, I can now post. So this post will be a little long as I babble on about how I made these cards. 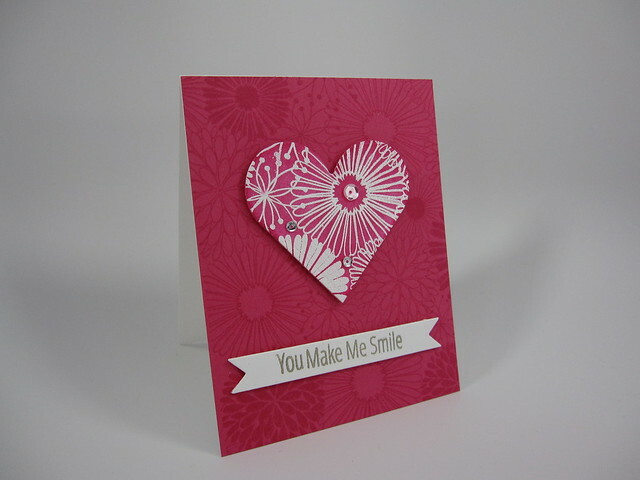 I love the bright reds and pinks I used in this card. The card was made for my son to give to his girlfriend and I was very pleased with the results. Watercolor paper was used to create the card front. The watercolor paper was wet with water using a slightly, wide paint brush before applying any ink. Distress Inks in Picked Raspberry, Fired Brick and Festive Berries were applied to one area of the card front to create the backdrop on which the sentiment was stamped. 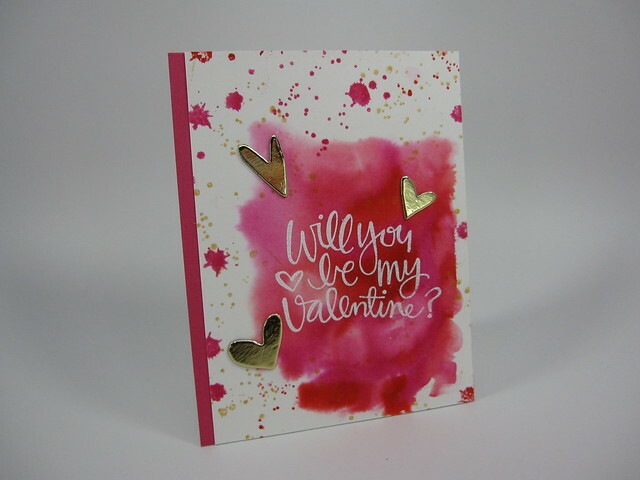 I used my heat tool to thoroughly dry the card front before I stamped the sentiment onto the colored area. The large sentiment from Simon Say’s Stamp’s Paper Hug stamp set was stamped using Versamark Ink and heat embossed using white embossing powder. I then randomly filled in the area around the sentiment with different splotches and blots from 2 stamp sets: Papetrey Ink’s Drips & Dribbles and Stampin’ Up’s Gorgeous Grunge. I love the look of splotches and ink blots on a card, but unfortunately I haven’t perfected a way to artfully splatter ink onto my card surface in the exact place I want, so I rely on stamps to do the trick. I envy card makers who can splatter so effortless and artistically onto their cards. Because of the warping of the card front, I had to cut it down a bit and adhere it to a PTI Raspberry Fizz A2 (4.25”x 5.5”) mat using Scor-tape so that it would lie flat. This was then adhered to an A2 top-folding, portrait-oriented card base. The card is light, bright and fun like my son and his girlfriend. I hope you like it. Supplies used in making this card: Stamps: Simon Says Stamp: Paper Hug for the sentiment, Papertrey Ink: Drips & Dribbles, Stampin’ Up Gorgeous Grunge; Cardstock: Watercolor paper for card front, PTI: Raspberry Fizz (as a mat for the watercolor paper card front), Neenah Solar 110lb for card base; Inks: Distress Inks in Picked Raspberry, Fired Brick, and Festive Berries; Tsukineko: Versamark Ink and Delicata Golden Glitz; Other: Hero Arts white embossing powder; Pretty Pink Posh Clear Sequins (6mm and 4mm), Studio Multi-Matte Medium (to glue down the sequins), Studio Calico: gold chipboard hearts. This is the card that I made to give to my two daughters for Valentine’s Day. They are both real sweethearts– funny, creative and intelligent if I do say so myself. I chose the sentiment because they would both cringe if I got too mushy and it expresses exactly how I feel when I think of them. The same background stamp from Hero Arts was used to make the embossed heart and the background for the front of the card. To create the card front, I stamped the background stamp on Papertrey Ink Raspberry Fizz cardstock, using PTI’s ink in the same color for a tone on tone look. The heart was created by stamping a piece of Raspberry Fizz cardstock with Versamark ink and heat embossing the piece with white embossing powder. I then used a heart die to cut a heart shape from the heat-embossed pieced. The heart was mounted against the background with foam tape to add dimension to the card front and make the heart stand out as the focal point. The sentiment was created using 2 sentiments from Avery Elle’s Simply Said: You stamp set. The sentiment was assembled and inked onto a die-cut banner using Versamark ink and heat embossed using Ranger embossing powder in Liquid Platinum. The banner was also mounted on the card using foam tape. The card front was mounted on a top-folding, portrait-orientated card base from Neenah Solar White 110lb cardstock. Clear-colored sequins from Pink Posh were added on the heart for a bit of bling. Supplies used in making this card: Stamps: Hero Arts: Everything Flowers (CG513) for the heart and the background for the card front, Avery Elle: Simply Said: You stamp set; Dies: Spellbinder Classic Hearts die set (third largest heart), PTI: Double-Ended Banner Die; Cardstock: Neenah Solar 110lb, Papertrey Ink cardstock in Raspberry Fizz; Inks: PTI dye ink in Raspberry Fizz, Tsukineko: Versamark Ink; Other: Hero Arts white embossing powder; Pretty Pink Posh Clear Sequins (6mm and 4mm); Ranger embossing powder in Liquid Platinum. I mass produced this card for Aunts, Grandmothers, and close friends (10 cards in total). It was fairly straight forward to make but my Vagabond machine got a workout with all the embossing and die-cutting. I used an embossing folder from Sizzix Textured Impressions to create the dry embossed hearts background on Neenah Solar White 80lb and cut down to 4”x5.25”. 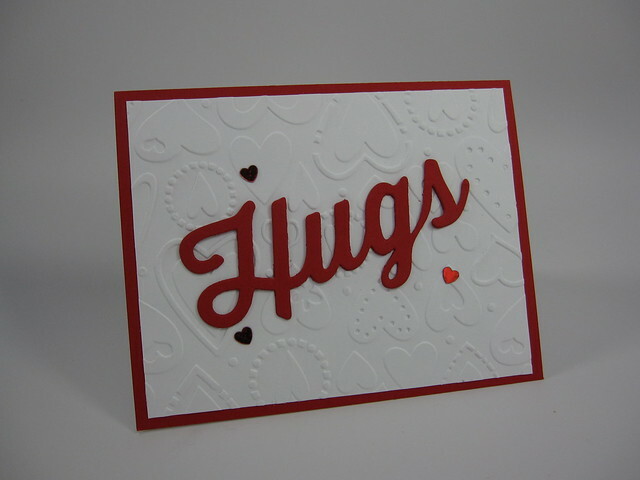 The “hugs” sentiment was created from Simon Says Stamp’s Big Hugs die using Stampin’ Up cardstock in Real Red. I die-cut the sentiment 3 times for each card and glued them together so the “Hugs” had the thickness of a chipboard piece. I glued the sentiment onto the embossed background with Tombow Mono Multi glue and added sequin hearts from Pretty Pink Posh using the same glue. I used an A2-sized piece of Real Red cardstock as a mat for the embossed background piece and the glued the entire front to an A2 top-folding , landscape-oriented card base of 110# Neenah Solar White cardstock. Though the card was simple, I liked the effect of dimension that the embossing folder, sequins and die-cut sentiment gave to the card design. Supplies used in making this card: Dies: Simon Says Stamp Big Hugs die; Embossing Folder: Sizzix Textured Impression embossing folder: Valentine Set #3; Cardstock: Stampin’ Up Real Red (for die-cut hugs sentiment and mat underneath the dry embossed hearts background, Neenah Solar White 80lb for the embossed background, Neenah Solar White 110lb for the card base; Other: Pretty Pink Posh Red Heart sequins, Tombow Mono Multi glue. I struggle to make Valentine’s Day cards for men. It seems that V-day is all about giving the female of the species cards and gifts that express love and admiration for them. Men deserve the same expressions of our love. But personally, the men in my life (primarily my husband and our son) don’t care about the frills and all the abundant shades of pink and red so prevalent this time of year. However, I do think red is a color for everyone. So I used it in this card and found a less frilly Valentine-themed paper in my stash of patterned paper that I thought would work for a more masculine theme. The patterned paper is from a small stack from Martha Stewart that I don’t believe is available anymore called “Love Notes”. I chose it because of the red and the graphic, rather than frilly look. I cut down the patterned paper to 4”x5.25” so I could mount it onto an A2 (4.25”x5.5”) Kraft card base that was top-folding and landscape-oriented. The Kraft card base set off the Kraft color in the patterned paper rather well and continued the masculine theme. I stamped an image of an old typewriter from an old Hero Arts wood-block stamp set I have (HA LP205) onto craft cardstock using Versafine ink in Black Onyx. I love this set and have held onto it because it has 4 retro images, one of which is a typewriter. Unfortunately this set is now discontinued, but the set still comes in handy when I’m looking for a retro look. 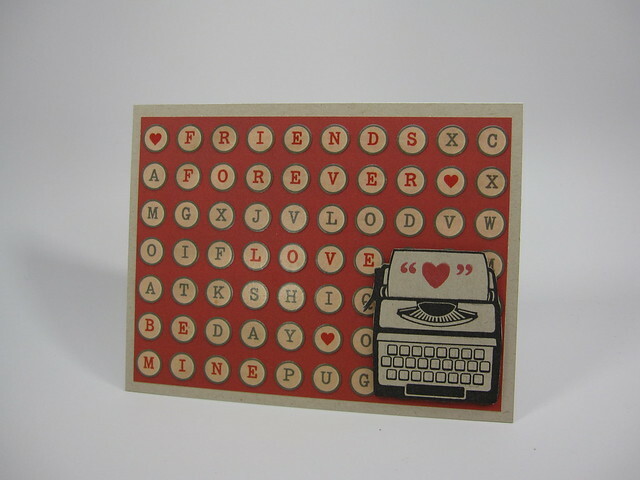 The typewriter was then fussy cut and mounted onto the card front using foam squares to give the card some dimension. The sentiment, if you could call it that, came from a heart stamp with quotes from a Mama Elephant stamp set called “Type It”. I really liked the whole effect of the card and its masculine flavor with a bit of humor in the sentiment. Hope you like this card.